Mt. 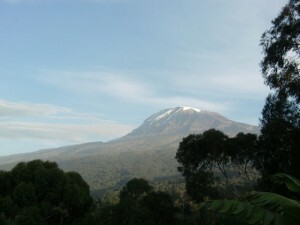 Kilimanjaro is the tallest freestanding mountain on earth at 19,500′. On arriving in Tanzania every year for our work trips, the first thought that comes to mind is “the mountain”. Our first glimpse of Mt. Kilimanjaro and it’s glaciered peak rising above the clouds is an anchoring image for us. It is Africa, it is our work, it is ‘home’. Kilimanjaro’s image has even greater impact for the people who live here. Ever present, she looms as a daily reminder, defining everyone who lives nearby or on her slopes as those who belong to the mountain. And she in turn provides for them, with countless fruits from the forests… with earth to grow vegetables in … and water from the glaciers. Children sing songs about this beautiful mountain, men tell stories of heroic adventures and women may know her best as the giver of water and life. But in recent years, the mountain has been struggling to provide for her children. Climate shifts have created rapid melting of the glaciers that have supplied water for a millienium to those who live here. It is a melting of such speed as to create a catastrophic loss of surface water and impairment to life. 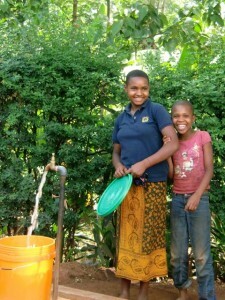 URU girls enjoying clean water access. Struggling to keep up with the receding water, the walks for water became longer and longer, leaving the women and children exhausted, ill and impoverished. It Can Be Done was born. Working in partnership with the Uru East community, a grass roots beginning based on cooperation, shared resources and ‘sweat equity’, has resulted in a successful pilot program for a community owned and operated Water Supply System. From the first maximum yield ‘Grandmother Well’ at Kimocholo, clean water is now flowing through a pipe system of 5 kilometers and 18 public taps. And construction will begin in February of the new ‘Grandfather Cistern’. This 100,000 liter cistern will double the amount of available clean water, and will double the number of people who will receive it. And there is more! The story of this successful community driven approach to problem solving and water supply has reached Kilimanjaro’s sister mountain: Meru Mountain. Supporters in the USA and in Meru villages have now partnered with It Can Be Done for preliminary research and water source development for two separate but cooperating Water Supply pilot programs in Meru. This is a secular and faith based cooperation among It Can Be Done, the Meru Lutheran Diocese, the Milwaukee Lutheran Synod which includes Our Saviour Lutheran Church/Oconomowoc Wisconsin and Our Saviour Lutheran Church/New Ulm Minnesota. From the top of the mountain we can see the long view… past, present and future. We see the many countless hands and hearts that have and will be working for water as LIFE. And in taking the long view we celebrate the power of individuals working together, to make real and lasting differences in the lives of others. May God bless all these hands and hearts with renewed strength, clarity of purpose and always… love.